Marriott’s Ocean Pointe Continues to go Above and Beyond! Marriott’s Ocean Pointe in Palm Beach Shores, Florida, continues to go above and beyond for the children within our hospital. Time and time again, they go the extra mile to host one more event, get one more donation, and make that much more of an impact. Within the past couple of months, they have already hosted kickball tournaments, a Thanksgiving 5k, and a Chilli cook-off. Through their events, they not only find the “fun” in fundraising, but are able to connect their community to the cause and explain why giving back is so important. 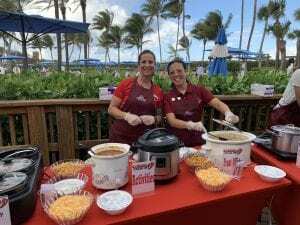 After brainstorming with their innovative team, Marriott’s Ocean Pointe decided to host their first annual “CMN Chilli Cook-Off” on February 20th, 2019. With hundreds of owners, visitors, guests, and community members in attendance, everyone lined up to purchase a $5 wristband and try 12 different chillis cooked by hotel staff and owners. Throughout the event, Marriott staff consistently thanked donors for their contributions and created a welcoming atmosphere full of excitement, fun, and most importantly, purpose. As the event ended, the crowd gathered around to hear the winners, but before the “best chilli of the night” was revealed, Gretchen Chua, Ocean Pointe’s Director of Activities, spoke on the importance of giving back and how Marriott is dedicated to bettering the lives of our kids. In 1983, Marriott Vacations Worldwide, as a part of Marriott International, began their relationship with Children’s Miracle Network Hospitals. Ever since then, they’ve given so much back to the community and have been quite the unstoppable partner. Since 2011, Marriott Vacations Worldwide has raised nearly $300,000 for UF Health Shands Children’s Hospital. As a whole, the Marriott brand family has raised more than $500,000 since their partnership began in 1987. Marriott has a unique relationship as a CMN partner and partner of UF Health Shands Children’s Hospital. Every year, they have the opportunity to host their own creative and innovative campaigns and events in an attempt to raise funds for their local children’s hospital. UF Health Shands Children’s Hospital is lucky to have partners like Marriott’s Ocean Pointe. With almost the entirety of 2019 ahead of us, we are thrilled to see what else is to come from this location and are excited to see the impact, improvements, and positive change that can be applied to our hospital because of their contributions and dedication to our children. 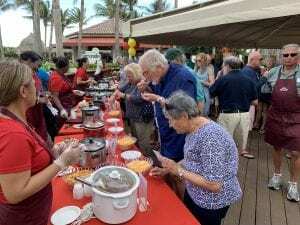 Chili #2 may have taken the cake at this year’s first ever Marriott Chilli Cook-Off, but in the end, this fun event rallied together an entire community for some good food and an even greater cause. And that was the real win.